I’ve always been a huge fan of the Starbucks coffee mugs. They have some really creative styles. The holiday collection is no different, they’ve got really great holidays prints to choose from. Today you can get one of their holiday mugs for $4.95 each! Head over to your local store or Starbucks.com to by online! 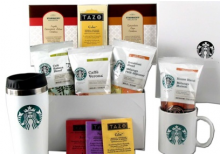 Offers Dec 4, 2011 in coffee, holiday, Starbucks · Expired! Starbucks is doing another 12 Days of Sharing this year. Starting December 1st thru the 12th, they are having 12 Days of Sharing. Make sure you text MERRY to 697289 to sign up to get the text message reminders. Here’s a little merriment holiday offer from Starbucks! Starting today Starbucks will be offering a B1G1 FREE holiday drinks between 2:00pm and 5:00pm. This can be very dangerous for me since Starbucks is less than a block away from me! For more details and store locations visit Starbucks! 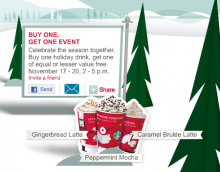 Offers Nov 17, 2011 in coffee, free, holiday, Starbucks · Expired! Have you tried the Starbucks Via Iced Coffee yet? Well if you’ve been wanting to, tomorrow is the day to do it. Starbucks is offering a FREE tall drink with the purchase of Via Iced Coffee. This offer will be going from July 14th – July 17th at participating Starbucks locations. 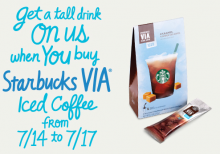 Offers Jul 13, 2011 in coffee, free, Starbucks · Expired! You still have a few more days to enjoy Starbucks “Happy Hour!” Take advantage of it today through May 15th. All Frappuccino’s are half priced. Head into Starbucks between 3:00-5:00pm to get the 1/2 price Frapps!